Day 8: A message from Elsa in the Pacific! I was meaning to write a longer message and blog, but writing is still making me feel sick, so putting it off for a few more days. Have attached photo though. Promise proper blogs soon. Have seen dolphins, humpback whales, a shark ( from a distance), and albatrosses. Amazing. Whales are so big! Creeping west – every night on sea anchor (bit of a faff as have to get rudder in and everything tied down etc, but getting more efficient), waves huge and really loud. Feeling challenged by weather, but always knew first first weeks would be especially hard. I look forward to rowing with the wind at some point, rather than against it. Big waves are both terrifying and exciting – like a theme park with no rules and no other people. Please pass on my thanks for lovely messages – apologies I’m not replying but they mean a lot. Photo not the best, but something I’d have liked to see in past. 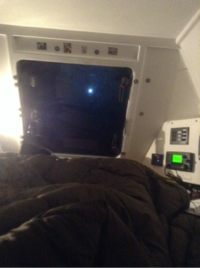 My nighttime view inside my cabin. Just to the left I’m making water into my Ortlieb. GPS etc on right. My legs in sleeping bag in middle. So great to hear from her! She mentions that she appreciates everyone’s messages – please keep them coming via the contact form! Fabulous to read this update – thanks Elsa & Steve. Great pic too – helps to imagine what it’s like. The children will love your theme park analogy. I am following your progress every day and trying to imagine what forces of nature you are encountering. You are a strong, amazing woman and I am quite inspired by your daring and bravery. Keep up the good work and know that there are a lot of us “strangers” out here rooting for you! Admire what you are doing. Keep up the great work! We’re all thinking about you at the University – you’re doing brilliantly. Keep rowing! Hi Elsa! Thanks for the update. We’re thinking of you lots in the office & we (still) think you are absolutely amazing. Got Steve & the team coming in for a visit today so will send lots of support back through them, but have some from us too! We’ve got 3 school visits coming up in quick succession before the end of the school year and then a big strategic push over the summer holidays. We’ll be using you for inspiration. Thank you so much for all of your efforts; we appreciate it so much. Send our love to the whales.